Last year, a whopping $10,000 was raised! 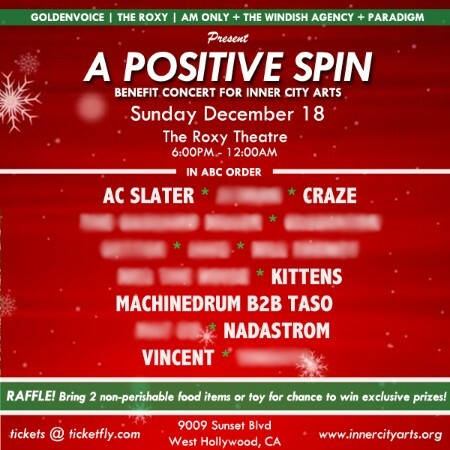 Renowned artist agency, AM Only, is hosting its second annual fundraising event, A Positive Spin, at The Roxy on Saturday 18th December 2016. All of the shindig’s proceeds will be donated to Inner City Arts, an arts education imprint in the heart of Los Angeles’ Skid Row that provides interactive guidance in all aspects of the arts — visual, performing and media. This year’s guest performers include AC Slater, Bixel Boys, Craze, Kittens, Machinedrum B2B Taso, Mat Zo, Nadastrom, Vincent, among others, who will be announced closer to the event date. Last year, a whopping $10,000 was raised! Attendees are encouraged to bring a donation of two non-perishable food items or an unwrapped toy, which will be donated to LA Food Bank and Toys for Tots. By bringing one of the aforementioned donations, guests will be entered in a raffle with prizes including show tickets, artists meet & greets, various record label and artist merch or Native Instruments gear.